Accomplishing this requires different stream characteristics at different times. The characteristics that are optimal for gas cooling are likely quite different than for cooling hot surfaces, particularly when dealing with fully developed fire conditions in a large compartment. 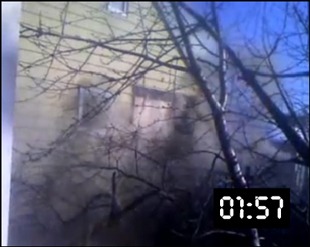 It is likely that direct attack on a fire with a high heat release rate in a large compartment may best be accomplished with a high flow stream having a high degree of stream cohesion and extremely large droplets. 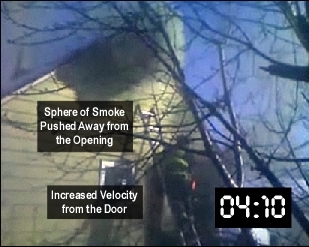 On the other hand, cooling the hot gas layer while accessing a shielded fire is most effectively and efficiently accomplished using a fog stream with a variable pattern angle, small droplet size, and a lower flow rate. 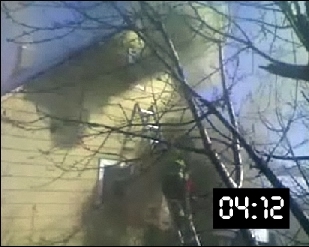 No nozzle and hose system will be equally effective and efficient in all situations. At present, there is no standardized method for testing and evaluating the effectiveness and efficiency of firefighting nozzles. However, there are a number of parameters that may be useful in the process of evaluating, selection, and specification of combination nozzles. Nozzle selection must be considered within the context of the nozzle, hose, and pump system that it will be used. If starting from scratch, it may be useful to consider each of these components. For example, high and ultra high pressure systems can provide considerably higher efficiency than low pressure systems, but they are limited to low flow rates. Low pressure systems on the other hand have larger droplet sizes and as such cannot achieve as high efficiency as higher pressure systems, but are scalable to deliver higher flow rates. If we have an existing system in place, the question may be what nozzle will provide the greatest effectiveness, efficiency, and range of capabilities. It is also important to consider the type of buildings and occupancies in which firefighting operations will likely take place. Important factors include building and interior compartment size and occupancy. Another factor that must be considered is pressure limitations imposed by fixed fire suppression systems such as standpipes (in some cases outlet pressure is limited to 65 psi (448 kPa). While there is no standard test methodology for determining the effectiveness and efficiency, there are a number of characteristics that can be assessed and evaluated when considering selection and specification of the handline nozzles. Central Whidbey Island Fire & Rescue (CWIFR), where I serve as Fire Chief is about to start the process of evaluating nozzles for use on existing 1-3/4� (45 mm) handlines. CWIFR is a small fire district with a mix of residential and commercial occupancies located approximately 60 miles (97 km) north of Seattle, Washington. Structural fire risks are predominantly wood frame, single family dwellings with a small number of apartments, commercial buildings and institutional occupancies. The district protects an area of 50 square miles and a population of approximately 9000. Four Type I Engines and three Type I Tactical Water Tenders are staffed with a mix of full-time, part-time, and volunteer personnel operating out of four fire stations. 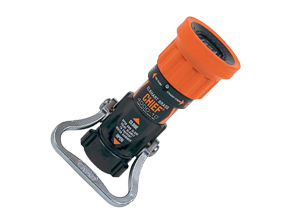 CWIFR currently uses Elkhart Chief 150 g/min (568 l/min) single flow rate nozzles that are designed to operate at a nozzle pressure of 75 psi (517 kPa) as the standard nozzle on 1-3/4� (45 mm) hoselines (similar to the nozzle shown in Figure 1, but CWIFR uses break apart nozzles with a separate tip and shutoff). Given the same flow rate, a nozzle pressure of 75 psi provides a slight reduction in nozzle reaction in comparison with a nozzle pressure of 100 psi (about 13% when operating a straight stream). However, all things being equal, lower nozzle pressure generally results in larger droplets. Larger droplet size is not necessarily a disadvantage in direct or indirect attack, but can significantly reduce effectiveness of gas cooling. Using the current CWIFR nozzles, flow rate can be increased to approximately 180 gpm by increasing nozzle pressure to 100 psi. 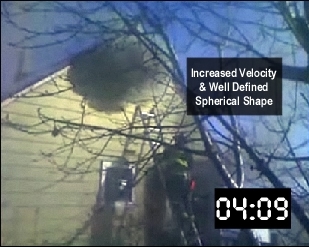 However, it is not possible to develop effective streams at flow rates significantly below 150 gpm as a nozzle pressure below 75 psi causes significant deterioration in stream quality, reach, and penetration. CWIFR�s nozzle tests will serve several purposes: First will be to increase members� familiarity with the nozzles currently in use, their capabilities, and limitations. The second will be to evaluate other types of nozzles that may provide a broader range of capabilities and increase operational effectiveness. Three variable flow nozzles and two automatic nozzles will be included in the initial round of testing and evaluation. All of the nozzles selected allow for development of a range of flows at a standard nozzle pressure of 100 psi. Three of these nozzles, the Wide Range Turbojet, Wide Range Phantom, and Midmatic have a higher designed flow capability than the nozzles currently used by CWIFR as well as the capability to develop effective streams at lower flow rates. 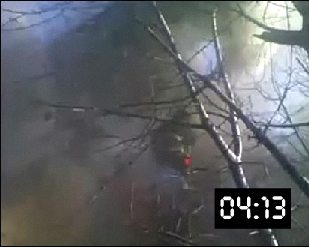 Two of these nozzles, the Turbojet and Ultimatic have a lower flow capability than the nozzles currently used by CWIFR, but have been found to provide excellent gas cooling capability based on laboratory tests (Handell, 2000) and anecdotal evidence during live fire training and operational firefighting. Physical and operational characteristics can be as important as stream performance as nozzles must be used under a wide range of operational conditions. Nozzle performance can be evaluated in a variety of different ways ranging from baseline data such as actual flow rates, range of patterns developed, and ease of operation. Other characteristics are a bit more complex such as pattern density and hang time. As identified above, performance will also be evaluated outside the designed pressure and flow range of the nozzles. For example, use of variable flow nozzles at the lowest flow setting at pressures above the designed nozzle pressure can produce extremely small droplets (more on this in a later post). While nozzle performance is the most important factor, it is also essential to assess the logistical and financial considerations. The next post in this series will examine the nozzles currently in use by CWIFR and provide additional detail on the evaluation process. 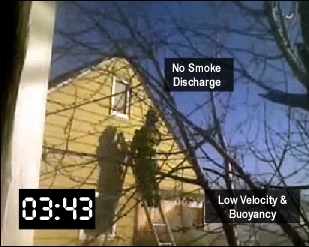 I am using this series of posts to work through the process of developing a chapter on the foundational scientific concepts related to practical fire dynamics and fire control theory. 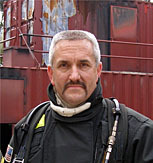 My hope is to take the middle ground between the oversimplified and unsupported explanations provided in most texts intended for firefighter training and the higher level materials intended for fire protection engineers. This is proving to be no small task! Your feedback on my success (or lack thereof) in providing scientifically sound, but reasonably simple explanations would be greatly appreciated. 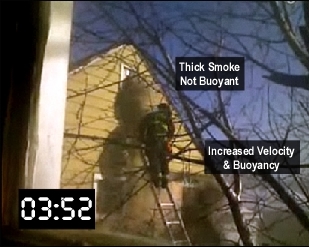 When faced with the challenge of developing firefighters understanding of energy, temperature, heat, and power in a limited timeframe, I generally avoid detailed discussion of the actual definition of the SI unit for energy, the Joule, and the mechanical equivalent of thermal energy. I have found that illustrating the concept of the Joule as it relates to thermal energy in terms of heating water to serve the purpose. However, as I looked back at the first post in this series, I think it would be useful to go back to the source, and examine James Joule�s experiments that made the connection to the equivalence of mechanical and thermal energy. 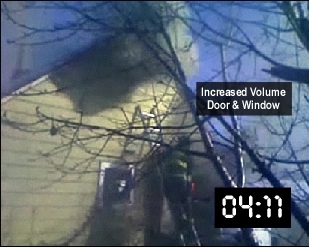 While not commonly used in scientific work, the American fire service has typically used the British thermal unit (Btu) as a measure of thermal energy. The Btu is defined in terms of the heating effect of energy transferred to water. 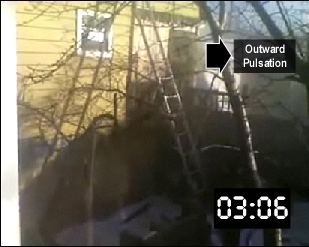 One Btu is the energy required to raise the temperature of one pound of water by one degree Fahrenheit. As discussed in the first post in this series, the SI unit of measure for energy is the Joule (J) which is defined in mechanical terms, but is applicable to all forms of energy. 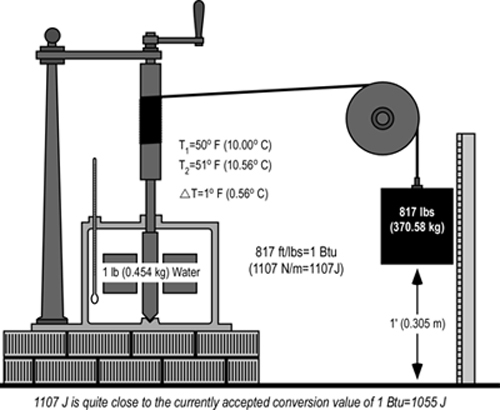 In the mid 1800�s English physicist James Joule demonstrated the equivalence of mechanical and thermal energy by using a mechanical apparatus to stir water in an insulated container with paddles driven by a falling weight (see Figure 1). Joule (1845) reported that based on analysis of data from a number of experiments, that expenditure of mechanical energy of 817 ft/lbs (the energy required to raise 817 pounds to a height of one foot) was the equivalent of an increase in temperature of one pound of water by one degree Fahrenheit. Conversion to SI units of measure is a bit complex, but 817 ft/lbs is equal to 1107 Newton/meters (the energy required to raise a mass of 1107 N to a height of 1 meter). While a non-standard measure of energy, the Newton/meter (N/m) provides a direct comparison to ft/lbs. In mechanical terms, a N/m equals the SI unit for energy, the Joule. Expressed in SI units, 1107 Joule of energy were required to raise the temperature of 0.454 kg (1.0 lbs) of water 0.56o C (1o F). This is quite close to the currently accepted conversion value in which 1055 J = 1 Btu. 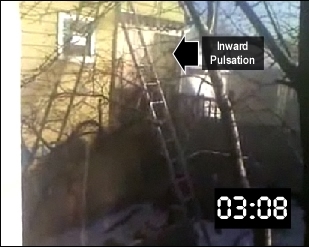 Note: Joule used a lesser weight falling over a greater distance, repeated a number of times. 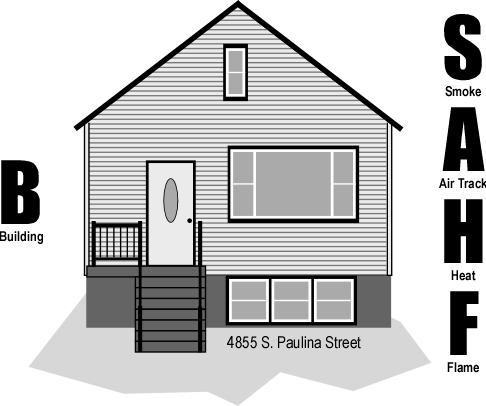 This drawing is simplified to provide a conceptual illustration. In everyday language the word heat is used in a variety of ways (many of which are incorrect from a thermodynamic perspective). In thermodynamics, heat is a method of energy transfer. Heat is not a form of energy (a commonly stated misconception), but simply the name of the process of energy transfer based on temperature difference. Objects do not �have� heat, they have thermal energy, and heat is thermal energy in the process of transfer to objects having a lower temperature. Even though it involves energy transfer, heat is not the same as work. Remember that work involves force causing movement in a direction influenced by that force (and if no movement in that direction occurred, no work is done). Energy transferred by heat results in an increase in molecular movement, but not in a specific direction, therefore no work is done. However, this does not mean that energy transferred by heat cannot be transformed into mechanical energy and accomplish work. Transfer of energy from one object to another must be classified as heat or work. When energy content changes, it must be the result of heat, work, or a combination of both. Heat and work are processes by which energy is exchanged rather than energy itself. The word flow is often used in discussing heat transfer (e.g., energy flows from objects with higher temperature to those with lower temperature). This helps visualize patterns of movement, but it is important to remember that neither energy nor heat is a fluid. Heat is the process of energy transfer due to temperature differences. This energy transfer takes place in a variety of different ways. Second Law of Thermodynamics: There are several ways to state this law. The simplest is that heat cannot spontaneously flow from a material at lower temperature to a material at higher temperature. However, thermal energy moves from materials at high temperature to those having lower temperatures until they have the same temperature (equilibrium). There are three methods of heat transfer, conduction, convection, and radiation. 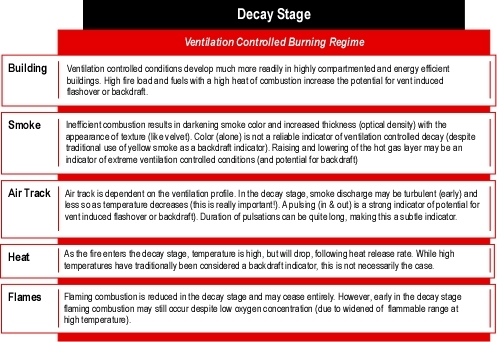 Each of these has significant impact on the processes of combustion, fire development, and fire control. Conduction of heat occurs when adjacent atoms vibrate against one another or as electrons move from atom to atom. Heat transfers through solid materials and between solid materials in direct contact with one another by conduction. The atoms in liquids and gases are further apart, reducing the probability of collision and transfer of thermal energy. 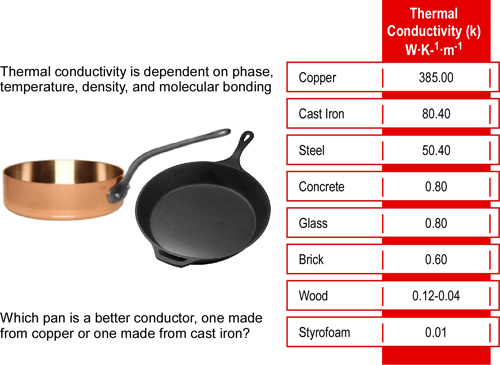 The factors influencing conduction are temperature difference, length (or thickness), cross sectional area, and the thermal conductivity of the conductor. When the temperature of one surface of a solid material is higher than another, heat will move through the material. Depending on the characteristics of the material, this conductive heat transfer may be slow or it may occur quickly. The rate of heat transfer is defined by the coefficient of thermal conductivity. 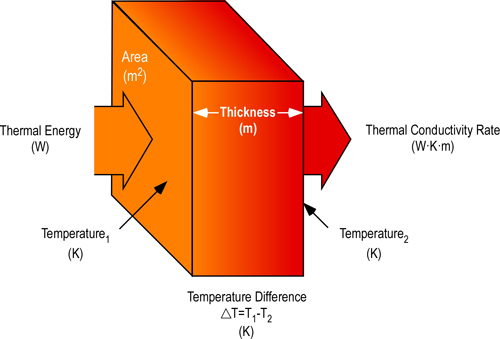 As illustrated in Figure 3, the total amount of heat transfer is dependent on the coefficient of thermal conductivity, difference in temperature, and cross sectional area of the conductor. It is difficult to measure thermal conductivity as it describes a semi-static situation with a constant temperature gradient. However, heat transfer results in temperature changes towards equilibrium (equal temperature at all points in the conductor). A high coefficient means heat moves very quickly; a low coefficient means heat moves very slowly. As illustrated in Table 1, the thermal conductivity constant (k) for different materials varies considerably. Metals are usually the best conductors of thermal energy due to their molecular bonding and structure. Metallic chemical bonds have free-moving electrons and form a crystalline structure which aids in transfer of thermal energy as illustrated in Figure 4. 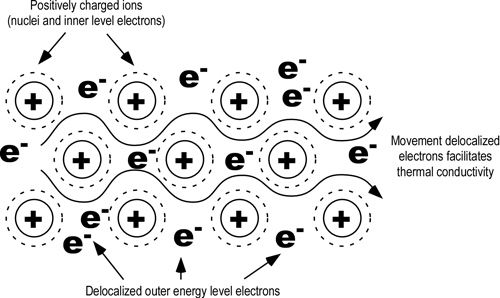 Because the outer electrons in metals are shared by all the atoms, they are not considered to be associated with any one atom. Since these electrons are attracted to many atoms, they have considerable mobility that allows for the good thermal conductivity seen in metals. In general, density decreases so does conduction (some unusual materials such as carbon foam, have low density and high conductivity). Therefore, most fluids (and especially gases) are less conductive. This is due to the large distance between atoms in a gas: fewer collisions between atoms means less conduction. Conduction is dependent on the area being heated, temperature differential, and thermal conductivity of the material. The next post in this series will examine convection and radiation as mechanisms of heat transfer. In addition, I will be starting a series of posts to discuss a comprehensive approach for nozzle testing from an operational perspective. Joule, J. (1845). On the existence of an equivalent relation between heat and the ordinary forms of mechanical power. Philosophical Magazine, 3(xxvii), p. 205.